I'm interested in other peoples experiences with making "things" in jars, preserved specimens etc. Couple of years ago i made about four, for other people and retained one for myself. 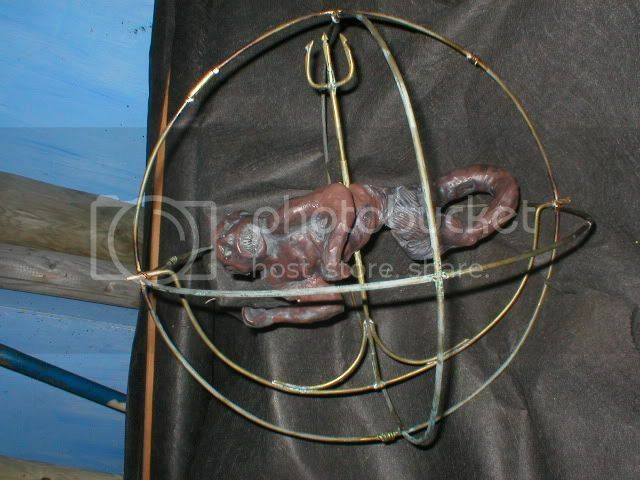 I constructed a brass armature and built up with Epoxy putty (Milliput) painted then with aluminium paint and then a combination of sponged household gloss paint and modellers paint and the odd glow in the dark patch. The ones for others i placed in jars and filled them with Glycerine. Thinking it would be best for preserving the paint. The one i retained, i filled with ordinary water with a dash of yellow food colouring. I expected the water to fairly rapidly peel off the paint, but that hasn't happened at all, indeed its the same now as it was when it submerged. Anyone had more experience with making such things? I can recommend Glycerine as a medium, when moved it shimmers like a heat haze then settles to crystal clearness. Is this the Feejee Mermaid you created? Either way pictures are certainly in order. 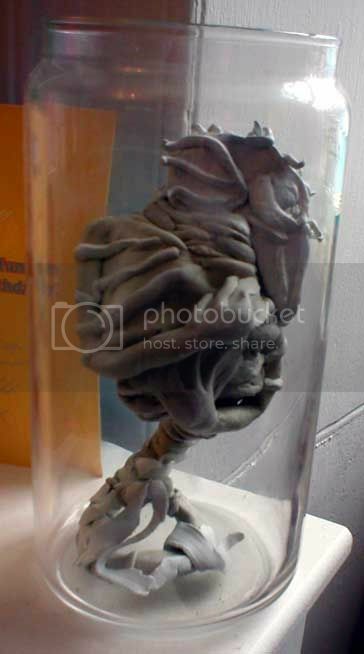 My favourite thing in a jar sin't a brain, malformed baby or gaff (as good as they are) but is from Peter the Great's collection which is an arm in a fine sleeve holding an eye ball. It just struck me as such an odd thing to do. and in her brass ball. SUPERB! 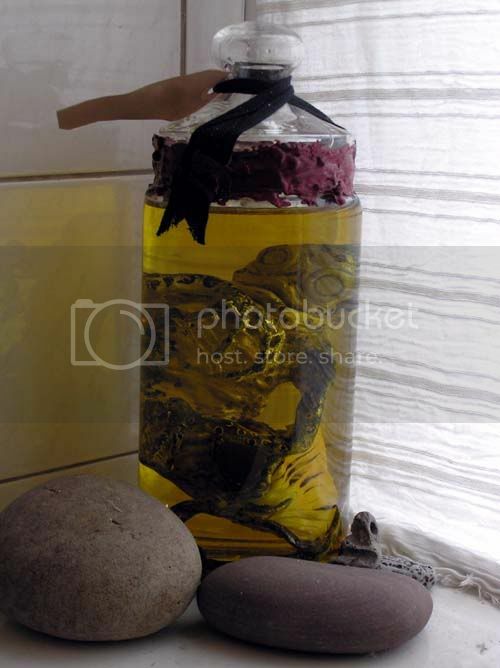 I've always wanted a Victorian type study with jars of stuff like fairies, frogs heads, and twisted taxidermy cases. I love those models tho! Well i set out with the idea that it would be difficult, but it turned out quite easy really... id recommend glycerine, but water with a dash of preservative does the trick too.. I bought a glass jar and some modelling clay the other day when I found those altitude meters on the market. 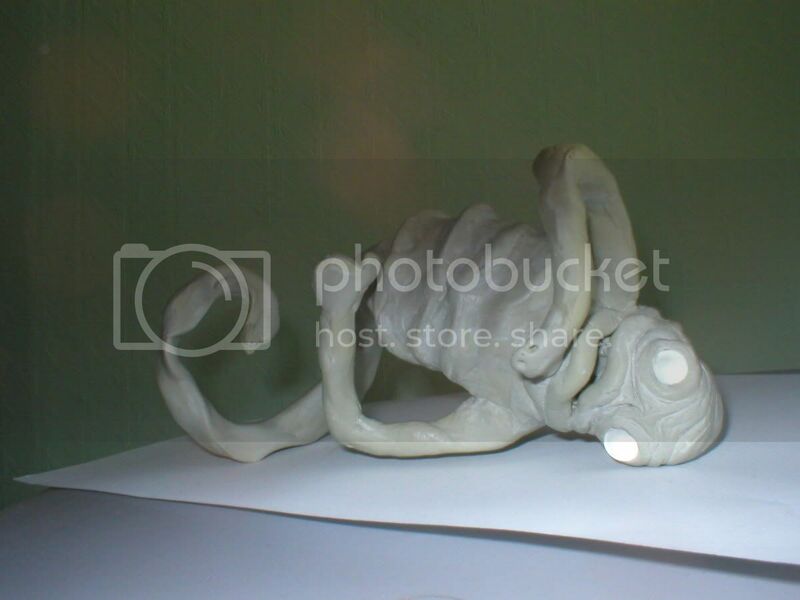 When I get chance I shall make myself a small creature specimen. Having had a lifelong interest in these sorts of things, I have acquired a bit of knowledge that has aided me in my own endeavours. For organic (read: dead animal) specimens, I've had reasonable results with ethyl alcohol. 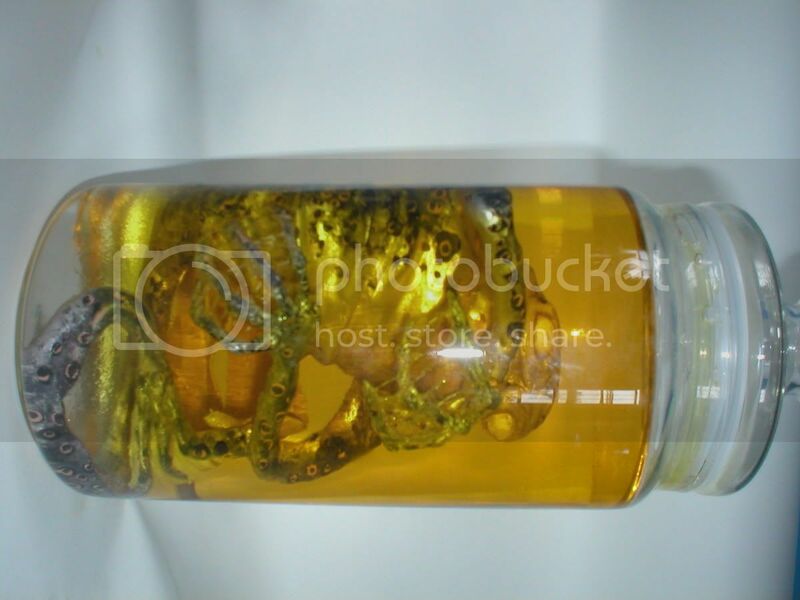 This is what I used to preserve the small lizard that my wife gave to me whilst we were courting. I haven't ever changed the alcohol, and it's been nigh on seven years now that he's been sitting in his beaker...the only problem is a slight discoloration of the alcohol itself, as well as loss of pigment in the skin of the lizard. I happen to like those two aspects, so it presents no hardship to me. I've had limited experience with natron (predominantly made up of sodium bicarbonate, soda ash and a small portion of sodium chloride). Natron, in its liquid form, is one of the mixtures used by the Aegyptians of yore to preserve their god-kings. Nowadays, it's commonly used to dry flowers and can be found at most well stocked craft stores, or you can make it yourself should you have access to the raw materials. As far as I can remember, besides darkening the colour of the specimen (sometimes quite dramatically), one of the only drawbacks to using natron is that you don't want to go getting it on your skin, and it needs to be periodically replaced. I have also come across a method wherein a suitable jar or vessel is chosen, and a two dimensional bitmap of, say a zombie character from a video amusement, is printed on standard paper. The paper is then rolled, with the image facing outward, and placed inside the jar. Wig hair, or crepe hair, is prepared and placed on top of the paper roll, to give more dimension to the object, and the jar is sealed. Done properly and used with low lighting levels, the effect achieved can be visually disturbing to those more sensitive individuals out there. To effect a "skin mask" or "Necronomicon" type skin covering, without resorting to hide tanning techniques, but with less realistic results, aluminum foil can be smoothed over an object (in my case, I had a small human skull lying around) care must be taken not to tear the foil when smoothing. Carefully removing the foil, acrylic paints in various grades of flesh are painted over the outer surface of the foil, and the shading and highlights are applied using an acrylic wash (mix a bit of water in with the paint until the desired consistency/translucency is achieved). The foil "skin mask" can then be stiffened from the back by applying (drizzling, really) hot melt glue. I don't have any pictures, and currently the website information for this method and the one above escape me, and for that you have my most humble apologies. Hopefully, this has been of some use. For an alternative on "things" in jars. I have seen a few neat articles on water gardens in large glass jars. Really strange looking but awesome. I have yet to pursue finding the right plants to do this with but plan too this summer. The Good Doctor comes to the rescue! My gratitude overflows, that is indeed the technique to which I was referring, well done! Terrariums have been popular for quite some time, my father constructed one inside of a rather large glass carboy when he was young. Alternatively, I have seen small shrimp aquariums inside of hollowed and cleaned out lightbulbs. I like Terrariums as I have always thought they were very Victorian. The ones I am referring too were rather odd in that they were just glass jars with water for water garden plants like a pond lily. Some of the shapes of the ones in the article (which I will now have to find so I can scan in a picture) were very creature like. Shrimp aquariums inside of lightbulbs? Those sound fantastic and I for one would love to see one. Maybe that would be a use for the seamonkeys you always saw/see advertised in the back of magazines. I helped a friend taxidermy some animals, and I learned that there are a great many products that are great to use for this kind of project, real animal or not. (I also learned duh, bleach is bad for preservation, what was I thinking! http://www.taxidermy.com/ has some intersting bits. and Wasco supply links from there. They have glass eyes, casts of animal bones, and the like. I have used isopropyl alcohol with fairly good success in the past, but you must be sure that the jar is well sealed up. On a tangent note, I took a grad. class in ancient near eastern religions, and while history books say Egyptians used liquid natron to preserve, they think now it was recorded wrong, and that dry powder was really used. They tried to mummify some foul, and the liquid natron group rotted very quickly. Great tips! I sculpted a dragon some time ago and finally have cleaned up the casting enough to attempt to paint it. Sidecar_John, do explain your painting technique on the creature in the bottom photograph. Beautiful work sir! I have seen liquid latex applied and peeled back a bit to approximate the skin disintegration effect on a pickled specimen. I will probably not do much in the way of painting my piece as I think, being an embryo, it needs to look less colorful. Sidecar_John, do explain your painting technique on the creature in the bottom photograph. Its aluminium paint, all over, then ordinary household paint sponged on. then the dots (which i thought to be trout-like) spotted on with a Q-tip with dots within dots, then some "Burnt sienna" artists oil paint thinned and washed over and polished off. That ones sunk in Glycerine. the eyes are glass beads, with the back painted with luminous paint (not a success the eyes don't shine at all). The Slime/webbing between the fingers is modelling cement, usually used to glue balsa wood, i think its persepex dissolved in solvent. You say you uses latex? i did think of that but thought it might disintegrate in the jar?..whats it lasting like? We use Plexiglas boxes, and inside is a sheet of Plexiglases folded in to an L shape epoxy (I think) to the side which makes the specimen appear to hover in the formalin. Really nice work - that pickled one looks particularily impressive. Macabre yes... but how much more so if it were a pretty girlie mermaid..... makes one think how "Lookist" we really are. I've always wanted to do a floating brain in bubbling fluid, along with the eyes/retinas and spinal cord still attached - ie, it was still "alive" and the, um, person still conscious of the fact that they were a brain floating in a jar. I got this idea from the Second Robocop movie, after the villians brain was removed and before it was placed in the bigger robots body. The Cliffhanger's story line features Zeppelins. Spectacular nonetheless. What I wouldn't give to have that in my study.